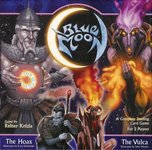 Blue Moon is a card game for two players, which has often been compared to Magic: The Gathering, although it has considerably different game mechanics. Particularly, it is not a CCG: There are no random cards in any expansion. It can thus be regarded as the first LCG, although it doesn't use that term yet. The standard game box contains the 'Vulca' and the 'Hoax' decks, a small gameboard and three small plastic dragon miniatures, used as scoring counters in the game. Other decks can be bought separately as expansions with 31 or 30 cards each.